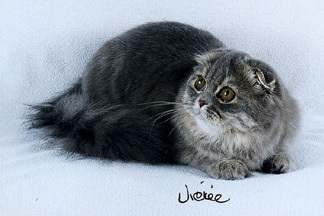 Skye is an adorable girl, with large amber eyes that reflect her keen interest in the world around her. Her soft long blue coat stays neat and clean, and is so soft when you pet her. She loves to play and will seek out any opportunity to have a good time; either with the other kittens or with the laser light; and the bed mice don't stand a chance when she's around. 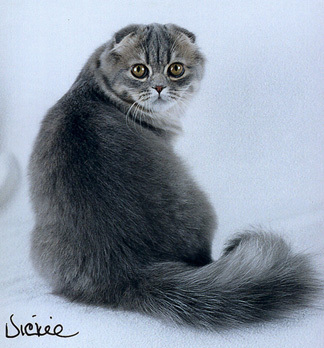 The "sweet look" that is so important in the face of the Scottish Fold is very evident on Skye. A sweet girl she certainly is. Congratulations to Kinross Blue Skye upon receiving the coveted title of Grand Champion in CFA! Schenectady, NY (September 16-17, 2000) and Syracuse, N.Y (September 23-24, 2000). that will prove a diligent mouser and entertaining character.